The MASTER II system simultaneously generates multiple amplitude-modulated, AM2 and/or frequency-modulated auditory stimuli, acquires electrophysiological responses to these stimuli, displays these responses in the frequency-domain, and determines whether or not the responses are significantly larger than background electroencephalographic activity. 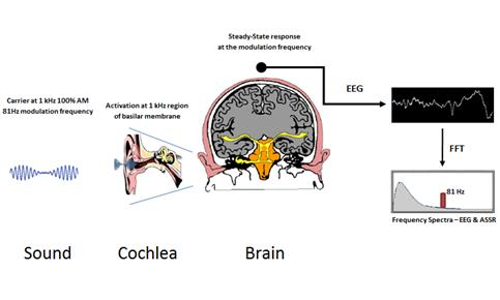 When the ear hears the tone, response occurs at the frequency of the carrier tone (stimuli activate the cochlear region that corresponds to the carrier frequency). When the ear hears the modulation of the tone, response occurs at the frequency of the modulation rate (ear and auditory pathways cause each tone to evoke a response at the modulation frequency). It is assumed that the part of the cochlea that is being stimulated by the carrier frequency (i.e. 1000 Hz) must be intact to respond to the amplitude modulation rate (i.e. 81 Hz) producing a response. The scalp-recorded activity contains the multiple superimposed responses to the various stimuli – the amplitude and phase of the response to each stimulus can be measured at the specific frequency at which the tone was modulated. Hearing level at carrier frequency can be assessed by measuring the response for modulation frequency.. The MASTER II includes both software and hardware and requires a PC station running Windows OS to collect and analyze auditory steady-state responses. The system is based upon the work of T.W. Picton, M.S. John and others at the Rotman Research Institute in Toronto Canada. The MASTER II user can print out the results, store the data on disk and review the stored data. The system design follows clear principles concerning the generation of acoustic signals, the acquisition of artifact-free data, the analysis of electrophysiological responses in the frequency-domain, and the objective detection of signals in noise. MASTER II allows collecting and analyzing multiple frequencies at same time – making the test faster, its stimuli has less spectral splatter; therefore, it more frequency specific. Higher intensities allow for increased information with patients with severe and profound losses. ASSR is an electrophysiological response, similar to ABR. MASTER II instrumentation includes insert earphones, surface electrodes and averaging computer. Stimuli are pure tones (frequency specific, steady state signals) activating cochlea and CNS. ASSR is generated by rapid modulation of “carrier” pure tone amplitude (AM) or frequency (FM). Signal intensity can be as high as 120 dB HL. ASSR phase or frequency is detected automatically. Reports – external application responsible for providing customizable reports. HW Manager – high level driver responsible for the communication with hardware unit (opening port, sending collection’s parameters, downloading raw data). Communication Drivers – USB and RS232 drivers providing support for communication between averaging unit and PC station.